Real Estate photography is a great commercial application of drones – while it may not be the most profitable drone photography business from a “per transaction” standpoint, the volume can easily make this a worthwhile proposition for drone operators in many markets. The RE photography is very often the first drone application that most aspiring drone photography entrepreneurs choose to pursue, as it is relatively low stress work, and offers a steady income once they establish a good network of clients. Just like many other drone operators, I can thank the RE photography for helping to get my business off the ground, and till this day I enjoy working with some of the top agents and companies in my particular market (NYC/Boston corridor). This article focuses on practical side of the business, and does not cover any legal issues concerning this subject, as the regulatory environment differs by country/market, and changes over time. Listen to Petr and Erick discuss Real Estate Drone Photography in our latest Drone Vibes Podcast! Getting a camera in the air no longer requires hours of building, programming and testing your equipment. Many of the available consumer and prosumer drones are fairly easy to operate with a little practice. With that said, it is still not a good idea to buy a drone and get on with your first job the next day. Your business reputation and whether your clients come back for repeat business depends on your ability to safely produce results that help your clients sell their properties. Learn to master your drone by practicing in different environments and light conditions, and to understand camera settings that produce the best results in different situations. Getting the drone in the air and pushing the shutter button is the easy part of this work, understanding the composition, light, and photo/video grading is what takes time to learn, especially if you’re coming into this with no previous photography experience. The novelty of the drone photography has already worn off, and the times when most clients were simply happy to have any aerial picture are over. As the entry barriers to the business are getting easier to overcome, you will find yourself competing on quality of your work rather than simply the ability to fly. The ability to produce well composed and graded photographs and video at a competitive price will ultimately decide your success in the business, so investing time into learning this part is a necessity for anyone serious about making it in the long run. Market not only the property, but also the location and Lifestyle. Spend time researching the location and the area. If it’s not practical to physically scout the location beforehand, Google Maps are your friend. 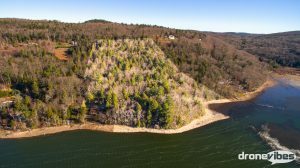 Remember that your work is not only selling the property, the power of drone photography is the ability to help sell the location and lifestyle. Look at the surrounding area and ask your client what property and location features are important selling points – some examples could be proximity to beaches, parks, golf clubs, schools, highways, ski slopes, etc. It is also important to know what your clients want to avoid – any nearby industrial structures, quarries, power plants, high voltage power lines, cell towers, or neighboring houses too close to the property. The position of the sun is crucial for proper lighting. The challenge here is choosing a proper time of the day when prominent parts of the property are well lit. In some cases, you may actually benefit from some clouds, which soften up the shadows, especially in high contrast environments (properties surrounded by woods, etc.). Sometimes it’s necessary to visit the location twice to capture all sides in proper light. If you’re planning to get larger area shots, you may want to consider choosing the first hour after sunrise or last hour before sunset (golden hour). This lends your photos great warm light, making them look really attractive. Ask your clients to make sure that the property is ready – coordinate with landscaper’s schedule, ensure there are no construction projects planned for the day of the shoot, and ask for any cars or other unwanted objects to be removed. Pools should have no covers, any patio furniture should be set-up and look inviting. The devil is in details, and while many things can be re-touched in still photos, it is very difficult, if not impossible, to do so in the video. Ask your client for a property map, and also about their preferred photograph crop – some may prefer to use 4:3 aspect ratio, while others use 16:9. I define the “roof inspection shot” as a shot that shows more of the roof than any other side of the house, looking pretty much like a Google Earth screen shot. While in some special situations you may not be able to avoid them, do your best to angle your shots in the way that shows more of the house than just the roof. Ask your client to meet you on location, and offer them a live downlink-if you don’t have an extra monitor for them to use, at least make sure that they can see what you do. Shoot the property in it’s entirety, be sure to capture any important nearby features (think: location, location, location! ), then focus on details like different structures on the property and notable property features. Drone shots don’t necessarily have to all be from higher altitudes, experiment with low “dolly style” video shots, even low to the ground drone stills can look great. If you have a chance, capture as many lifestyle shots as you can – a great example would be capturing boats or beaches when shooting a property near the ocean. Think “Marketing”, not “Roof Inspection”. Here is where you can turn your photos and video clips into art that will help your clients market the property, and differentiate yourself from your competition. Besides obvious things, like adjusting white balance, contrast, saturation, and clarity, touch up any undesired objects in the photos-pay attention to details, because your clients do! For video editing, try keeping your video short – 120-180 seconds is ideal (you may need to go over 3 minutes for large and special properties). We live in a short attention span era, and very few people are going to watch a five minute real estate video. Choose a royalty free licensed music track – do not pirate the music as this may have unintended consequences for your clients. The choice of music track is really important – the music can make or break your video. There are two factors that I consider when choosing the music for my videos – the property and location setting (urban, rural, oceanside, etc. ), and the intended audience your clients are planning to market this video to (young professionals, families, retirees). It is a good idea to create a small music track library and share it with your clients to choose from. Check out the huge libraries of available royalty free music tracks at audiojungle.net or audioblocks.com. I use different ways of making the video flow – either I start with the location and lifestyle shots and work my way to the property details, or start with the property details and “evolve” the video to the location and lifestyle. You can use simple subtitles to highlight the most important points in the video, and use tracking masks to highlight the property borders – especially useful for very large properties as it gives the potential buyers a good idea of what they’re getting. Be sure to double-check that any boundary highlights are accurate, as any gross inaccuracies may create uncomfortable situations for your clients. Ask your client for company logo and include their contact information in the video. MLS service does not accept videos with any logos or realtor specific information, so create a copy of the video without them if your client is planning to use the video on MLS (most agents do). Be sure to discuss with your client what resolution and format is optimal for their website, some use compression that may ruin the video. 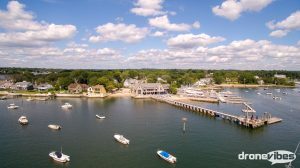 Property boundary highlights are a great way to market large properties in drone videos. the overall market you’re in. the property size and price. your experience and quality of your work, compared to your competitors. the cost of doing business (equipment reinvestment, licensing and compliance, insurance, marketing, admin, etc). Some operators have a set tiered price list, some prefer to quote each job separately, while many use a combination of both. Some brokerages or sellers contribute to the marketing expenses of their agents, however most of the Real Estate agents are usually paying this from their own pocket, and the cost is a large factor when they’re deciding who to use to help them market their available properties. 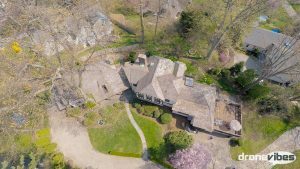 For many drone photographers, the Real Estate transactions are some of the least profitable, but perhaps the highest in volume. Develop and maintain good relationships with your clients, as this is a great way to get referrals and more work from them and their colleagues. Use social media (LinkedIn, Facebook, Twitter) to keep your brand and business in front of your clients. Offering special pricing on multiple projects or to high volume clients is also a great way to attract repeat business. Connect & Comment: please, share your own RE photography tips or ask questions in the comment section below! A good article and I’m impressed with the editing (and flying) but how do you do the Property Boundary Highlights? That’s the icing on the cake!